Hapag-Lloyd Cruises’ latest vessel, the 698-berth Columbus 2, arrived at Palma de Mallorca this morning after the second of two pre-inaugural cruises before she is renamed in Palma tomorrow. Operating until now as Oceania Cruises’ Insignia, she will replace the 420-berth Columbus, which goes to Plantours & Partner of Bremen next month as ms Hamburg. During the cruise, Hapag-Lloyd Cruises also chose to reveal further details of their latest newbuilding, Europa 2, which is now under construction at St Nazaire. Meanwhile, an earlier Europa, that of 1981, now operating as Saga Sapphire, has suffered not only a delayed maiden voyage but also an engine breakdown on her delayed cruise and passengers are being flown back today from Valencia, where she is undergoing engine repairs. About 200 trade and 100 golfers returned to Palma de Mallorca this morning from a 2-night pre-inaugural voyage to Menorca and back on board Hapag-Lloyd Cruises new 698-berth Columbus 2. To be christened in Palma tomorrow by Carmen Riu Güell, chair of Riu Hotels and Resorts, Oceania’s former Insignia has been taken by Hapag-Loyd on a two-year charter with option for a third year. As she will operate in the German-speaking market only there will be no International Hostess, as there is on other ships in the Hapag-Lloyd Cruises fleet. Compared to the 420-berth Columbus, which she replaces, Columbus 2 has a passenger space ratio of 43.4 gross tons per passenger, as compared to 36.3 on Columbus. Columbus 2 also has a third more cabin space at entry grade, at 200 sq ft compared to 150 sq ft on Columbus. As well, Columbus 2 offers two-thirds veranda cabins compared to just two on the Columbus, and has only 8% inside cabins compared to 31% on Columbus, so this will be a big advance for Hapag-Lloyd Cruises’ premium German product. 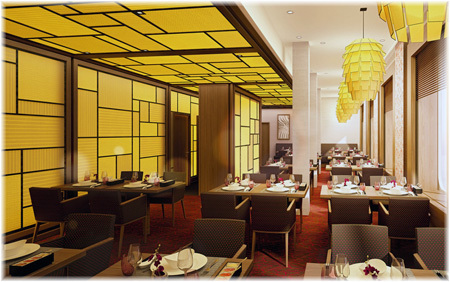 For dining, Columbus 2 now offers a choice of three restaurants, the main Albert Ballin Restaurant, plus two alternative restaurants, the Polo Grill steakhouse and Toscana Italian restaurant, the latter two at no extrra expense but requiring reservations. 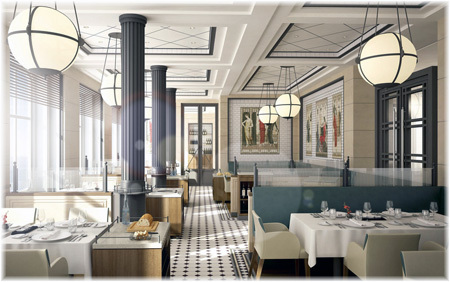 In addition, the ship’s Lido restaurant will open for breakfast. lunch and dinner. In order to widen the market for the new ship, a number of specially-designated family cruises will be offered, carrying children up to age 15 free of charge when travelling with two adults in the same cabin. On all other cruises, children up to 11 will be carried free and those between 12 and 15 will be charged just €25 (about $35) per night. In aid of this, two children’s rooms, one for kids and one from teenagers, have been installed on deck 9. In terms of the other changes that have been made on board, the biggest is that the casino has been completely removed and replaced by a new lounge and bar called Martinis. Slot machines have been replaced by leather-look banquettes for seating and the roulette and blackjack tables have been replaced by a dance floor, where music is supplied after dark by a resident DJ. Elsewhere, the library at the top of the ship is now stocked with German-language books, television channels are all German and new Continental-style individual duvets have been added to the beds. As the Columbus 2 comes into service, preparations are meanwhile being made for the Columbus to be delivered next month to Plantours & Partner of Bremen, who will operate her as the ms Hamburg. During the course of this weekend’s pre-inaugural cruise on Columbus 2, Hapag-Lloyd Cruises took the opportunity to release further details of the 516-berth Europa 2 that is now under construction at STX France in St Nazaire. As part of the cruise line’s marketing plan for the new ship, it has entered itno an agreement with Prefferred Hotels Group of Chicago to promote her in international markets. Perhaps the biggest change from previous Hapag-Lloyd Cruises vessels will be the fact that every cruise on Europa 2 will now also be marketed internationally. In terms of branding, Hapag-Lloyd Cruises will work internationally with companies such as Cor of Germany for furnishings, Miele for kitchenware, Moet et Chandon for champagne, Steinway for pianos and Steiff for children’s teddy bears and books. In addition, in a manner similar to upmarket hotels, it will work with Superba mattresses of Switzerland. 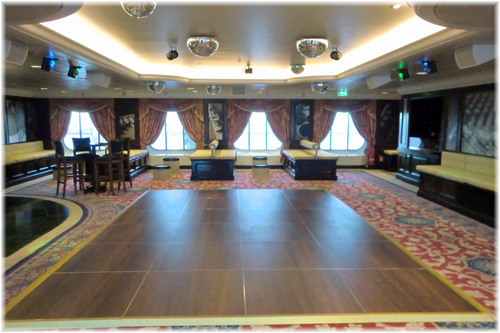 For the new ship’s interior design, Hapag-Lloyd Cruises is working with Partner Ship Design of Hamburg as well as STX France to produce the ultimate best design for lounges and restaurants. Among some of the stunning designs produced so far are the 44-seat Tarragon (French) restaurant, the 48-seat Elements (Asian) restaurant and the 56-seat Serenissima (Italian) restaurant, as well as the 58-seat Sakura sushi restaurant. Meanwhile, the main Seven Seas restaurant will accommodate 266 and the Yacht Club buffet 276, of whom 134 will be seated outside. Differences will also be evident in that Europa 2 will be a less formal ship, offering shorter cruises for people who are still working, and she will also court more families, even offering family cabins. 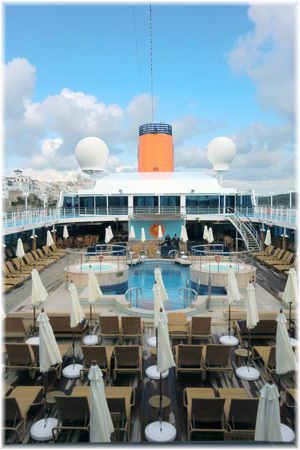 A good part of her clientele is also expected to be first-time cruisers attracted from resort hotels. The new ship will be more smart casual than traditional and a slightly more contemporary development of the top-scoring Europa, whose DNA she will share in a different way while still being family. As mentioned earlier, one of the key differences with Europa 2 is that every voyage of will be sold in the international market. It is felt by Hapag-Lloyd Cruises that developing a critical mass of English-speaking guests willl give the international crowd a better welcome and make them feel more at home on a German ship. 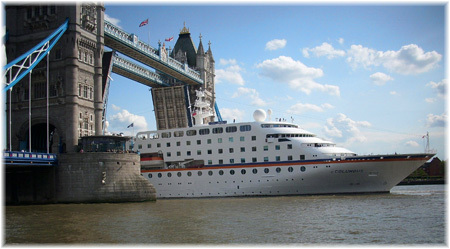 The emphasis with Europa 2 will be on offering a very exclusive travel experience, high crew to guest ratios and service standards and a wide choice of top notch gastronomical experiences, with the maximum possible recognition of indiviual needs, in other words a more 21st Century lifestyle-oriented version of the traditional 20th Century quality Europa product. Compared to the existing top-scoring Europa, Europa 2 will have all-veranda suites and cabins compared to 82% in Europa, and she will carry 516 guests, or about 25% more than Europa. The new ship’s accommodation will include 18% large suites as opposed to 6% in Europa, a three-fold increase in proportional terms, and suite sizes on Europa 2 will range from 280 sq ft to over 1,000 sq ft for the two Owners Suites, not including their verandas. Among the new ship’s lounges will be a 157-foot Belvedere Lounge, which will also be used for tea and coffee, a 125-seat Sansibar Lounge, which will also be an eatery with 77 outside seats, a 60-seat Jazz Club, a 34-seat Cigar Bar and a 15-30-seat Piano Bar. Drinks and snacks will also be available at the Pool Bar. Looking to an earlier Europa, the one that was built in 1981, this ship has just entered service for Saga as their Saga Sapphire but has broken down on her maiden voyage, which was due back in Southampton on April 18. The inaugural voyage had already been delayed from March 26 until April 3 by a strike in the Fincantieri shipyard in Sicily where she underwent her four-month long conversion from Croisières de France’s Bleu de France. For the past three days, the 706-berth Saga Sapphire has been stranded in the Port of Valencia, with problems affecting one of her two main engines. Over the weekend came news that her maiden voyage was now being abandoned with passengers being flown back from Valencia today. Her next voyage, which was due to depart on April 18, will now depart from Marseilles on April 25. Maiden voyage passengers will receive a full refund and a reduction on a future cruise and those leaving from Marseilles on Wednesday will receive a 50% refund.